4-H’ers are invited to explore more about the fascinating story of the hardworking honey bee by participating in the North Carolina 4-H Beekeeping Essay contest. The essay provides a platform for youth to creatively express their working knowledge and research of the craft of beekeeping. The 2019 Essay Topic is “Honey Varietals, State to State” Each jar of honey reflects an unrepeatable combination of climate, soil, weather, and flowers. Each state has unique honey varietals that beekeepers can market to their customers. Please identify one unique varietal to your state and discuss the flower’s uniqueness and how beekeepers can effectively market that varietal. In your essay, please include a photo of the varietal’s flower, an interview with a local beekeeper who collects this varietal and a recipe that highlights the varietal. Contact the extension office if you need help getting connected with a beekeeper! Essays are due February 15, 2019, at 5 p.m. and should be emailed to liz_driscoll@ncsu.edu. 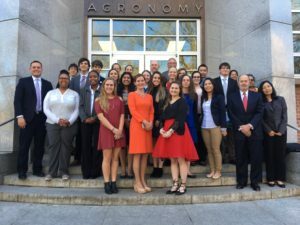 The Department of Crop and Soil Sciences is delighted to invite high school youth to participate in the North Carolina Youth Institute on Friday, April 5th, 2019. This program is part of the Global Youth Institute and World Food Prize and provides a platform for students to research and give recommendations to solve key global challenges that range from food insecurity, access to potable water, poverty, human rights and more. On April 5, students attend the day-long program at NC State University and share their research paper among peers and a panel of judges. Hands-on workshops, field trips, keynotes, and career development will round out the event. There is no registration cost to participate in the Institute, however, both student and teacher/mentor participants must organize their own transportation to and from the event in Raleigh, NC. Forsyth County 4-H’ers should copy Mrs. April (awbowman@ncsu.edu) or Mrs. Monique (dmpearc3@ncsu.edu) to receive 4-H scholarship dollars/credit for their essay IN ADDITION to following the directions listed in the essay. • How Will Dying Honeybees Affect My Life?